If you constantly battle with weeds, moss, or slow growing turf, it is likely that your soil pH is out of balance. What does this mean? 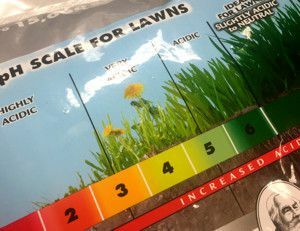 Our lawns grown best in slightly acidic soils (values somewhere between 6.5 and 7). However when soils creep to more acidic levels, our lawns are suffocated, and lack the desire to grow. As a result, weeds attack the lawn and become more prevalent. Moss can creep through the lawns as well, especially in the more shaded areas. If this sounds like your lawn, then we would recommend a quick test of the soil pH. These test only cost a couple of dollars and take only a couple of minutes to perform. Your result will help you determine if corrective action needs to be taken. If your soil pH is too acidic, then you will want to “sweeter” your lawn with a simple application of fast-acting lime (ie. Jonathan Green’s Mag-I-Cal). You will be surprised at the results! All of a sudden, your grass will be able to fully utilize all of those nutrients in the fertilizers that are spread (rather than them going to waste). As a result, weeds will be less likely to encroach on the lawn, and moss will fail to overtake shaded areas. One application of fast-acting lime each spring (or fall) is a great way to make sure that your lawn is always in balance. If you are ever unsure, then a quick and simple pH test is your answer.